At True Shine, we believe that giving you the very best window cleaning service takes more than top-notch squeegee skills. 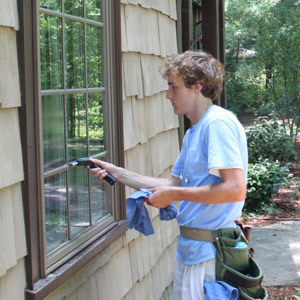 That’s why the quality of our work extends beyond the new shine we put in your windows, lights, decks and exteriors. From the initial bid to the completion of a job, our customers know we’ll be punctual, reliable and professional. Our crews are always trustworthy, friendly with families and careful with furnishings. Since we began in 1999, our crews have been made up of hard-working college students and post-grads. These young pre-professionals often work with us for several seasons before moving on to careers as business managers, engineers, teachers and pastors. Dedicated and forward-thinking, they take customer service very seriously. Over the years, it’s become clear that the strong impression our crews make is closely linked to the loyalty of our customers, the steady growth of our business and our glowing reputation. While we’re proud of our A+ Better Business Bureau rating, we are convinced that what truly makes our work shine is the integrity of our workers. If you would like to apply to become a part of the True Shine crew please click below to be directed to our online application.